Krug’s 1976 Vintage, tasted from magnum, is rich, deep and powerful, with Riesling-inflected veins of minerality that run through a core of orange peel, ash and dried flowers. A deeply Pinot leaning wine, the 1976 offers notable richness and breadth throughout. The 1976 vintage in Champagne is remembered for a hot, dry growing season with an early harvest that produced intense powerful wines. 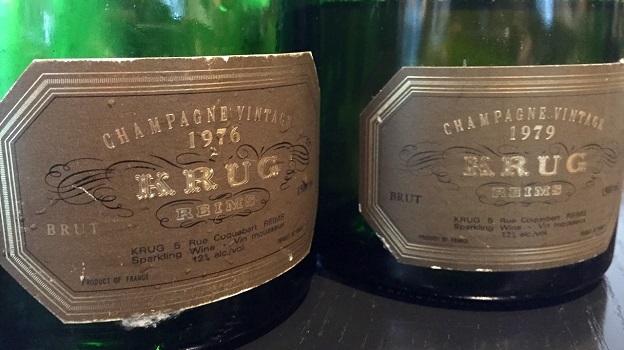 Krug’s 1976 Vintage is now fully mature. Well-stored examples should continue to drink well for a number of years, although there is no upside from cellaring bottles further. Interestingly, this 1976 magnum was aged on cork, rather than crown capsule, like the 1979 tasted alongside it. 94/Drinking window: 2015-2018. Nineteen seventy-nine is one of the all-time great vintages for Krug. Among other things, it marks the first release of Krug’s Clos du Mesnil. The 1979 Vintage, tasted from magnum, is utterly magnificent and nearly as thrilling as the Mesnil. Miraculously fresh for a wine of its age, the 1979 pulses with remarkable energy and tension, with the Chardonnay coming through nicely in the wine’s overall brightness. Lemon oil, white flowers, almonds, crushed rocks and dried herbs are some of the signatures. Krug’s 1979 is testament to the towering stature of this iconic Champagne vintage. To be sure, the magnum format helps, but I have had bottles of the 1979 that are every bit as moving. 98/Drinking window: 2015-2025.